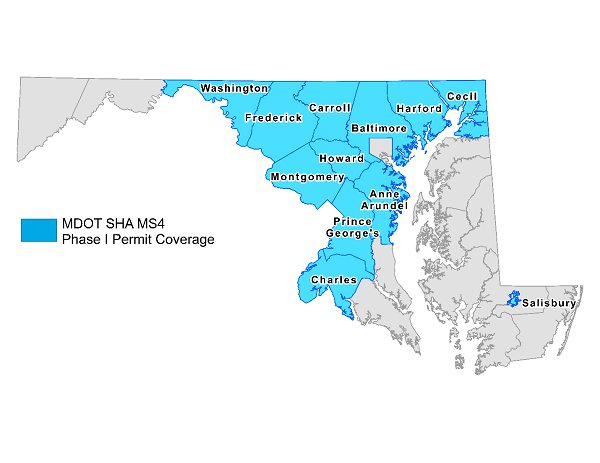 In 2015 MDOT SHA received an NPDES MS4 permit (No. 11-DP-3313) from the Maryland Department of the Environment (MDE) to control storm-drain-system pollutant discharges in MS4-designated areas (see map below). The permit requires that we use restoration practices to treat 20% of existing MDOT SHA impervious surfaces and address stormwater wasteload allocations (WLAs) established under US Environmental Protection Agency (EPA)-approved Total Maximum Daily Loads (TMDL). Review latest draft MDOT SHA TMDL implementation plan.